Guests dine while seated around a 50,000-gallon tank, home to a wide variety of fish, sharks, stingrays and more! The bottom of the sea décor and inventive menu offer guests a dining experience like no other. 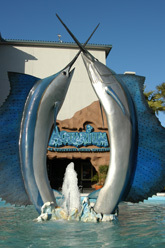 The Aquarium is located at the incredible Kemah Boardwalk. Hours of Operations subject to change during summer and winter months. 10% military discount at the Aquarium Restaurant. Must show valid military ID or VA ID Card when purchasing. Please ask your server for more details.